NHL News : Breaking: Domi gets first suspension of the season for gutless sucker punch! Breaking: Domi gets first suspension of the season for gutless sucker punch! Montreal Canadiens center Max Domi has been handed down the first suspension of the season from the NHL’s Department of Player Safety after a senseless sucker punch to Florida Panthers defenseman Aaron Ekblad. The League has decided that the young forward will sit out the rest of the preseason for the incident that took place last night in the Panthers 5-2 victory over the Habs. 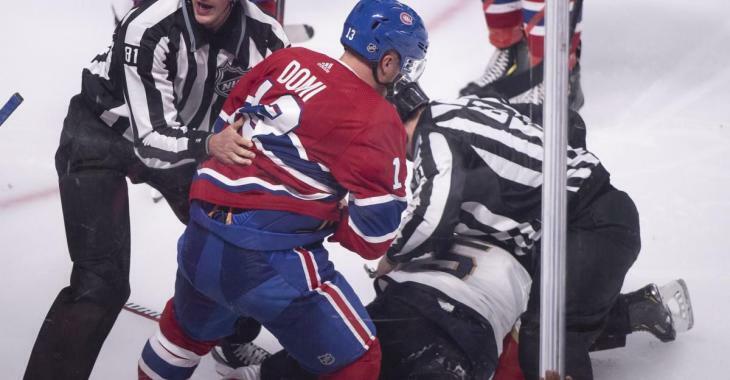 With the Canadiens losing 2-1 at the start of the third period, Domi thought it’d be a good idea to drop the gloves and spice things up. He tugged on Ekblad’s shirt, asking him to fight, which Ekblad had no interest into. Nonetheless, Domi punched him in the face twice, but still Ekblad didn’t respond. That’s when Domi dropped his right glove and sucker punched him right on the nose. The bloodied Ekblad dropped to the ice. Domi was given a minor, major and match penalty on the play. The Panthers defenseman left the game, at the league’s request, and did not return. He went through tests after the game and has since cleared concussion protocol. You can see how the incident took place in the video above. "I'm sure the league will look at it and we definitely won't forget about it," said star goalie Roberto Luongo, who played the first two periods of the contest. "You don't do that. You respect your opponents and if your opponent doesn't want to engage in a fight, there's no reason to drop your glove and punch him square in the face. "Bit of a gutless play. You don't do those types of things." The good news is that Ekblad came away from the incident relatively unscathed. He was held out of the game for the remainder of the third period, and coach Bob Boughner said post-game that Ekblad hadn’t suffered a concussion. "NHL Player Safety will review it. It's in their hands now," said Boughner. "We had a delayed penalty and Ekblad was just trying to stay out of it. I didn't expect that he was going to drop his glove and sucker punch him." The message has now been sent across the league, so you bet the rest of the players will know not to pull anything like Domi did on Wednesday night. In the meantime, the Habs can appreciate the fact that Domi isn’t a repeat offender and will likely learn from this suspension.